Dyan "Durty Dyana" Triplett was born September 21, 1965 to the late Edmon and Mary Triplett. She was the youngest. Dyan was baptized at an early age at Mt Hebron Missionary Baptist Church in Des Moines, IA. She attended Roosevelt High School where she was on the cheerleading team. Dyan moved to Arkansas in 2005. She loved her children, especially her grandchildren and cooking and doing for others. 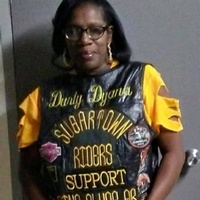 "Durty Dyana" was a longtime member of Sugartown Riders MC/SC the Pine Bluff chapter. She leaves to cherish her memory her children, Shanyce Lynette Triplett, Shanell Lynette Triplett and Sharell Lynette Triplet all fo Pine Bluff, Arkansas. She also leaves her siblings, Mary Ann Triplett Thomas, Carla Kay Triplett, Veronica "Boo" Irby, Stephanie Parsons, Zola Mae Garett, Jettie Jordan, Edmon P. Triplett, Jr. and Thomas Ingram. Dyan leaves 4 lovely grandchildren, a host of nieces, nephews, cousins and many friends. Dyan was buried on April 16, 2019.